Children will take their eating habits into adulthood and will undoubtedly shape their life which is especially important nowadays where child obesity, chronic and autoimmune disease in developed societies are skyrocketing. That is why we believe every child should know how what they eat influences their health and how simple it is to eat a healthy balanced diet. A class will be offered during school hours as a curriculum activity for English or Physical Education. Every child may attend a nutrition class for only 100 czk each. 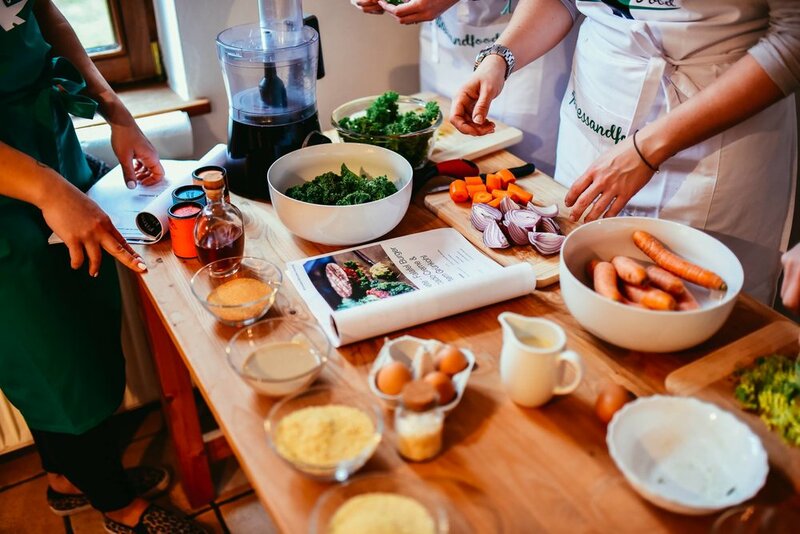 A 30-week course combining a complete overview of biology, metabolic processes, health and cooking in order to give a complete understanding of an optimal diet for humans and the skills to easily prepare nutritious and tasty meals. We know that a typical day fast-paced working day, a full schedule and pressing work environments take a toll on the energy and time we are able to commit to preparing and enjoying healthy meals especially being surrounded by fast food options on every corner. How can we find the motivation and enthusiasm to make conscious lifestyle choices to manage stress and keep high energy levels whilst dealing with the pressures of our personal life and the expectations of our day to day commitments in our current society? In this introductory seminar, you will learn the nutritional requirements, which are necessary in order to sustain our physical bodies and elevate our energy levels while maintaining our health and wellbeing. We will demonstrate the basics of prevention of chronic disease such as heart disease and diabetes which are the leading causes of death in the developed world. The first hour includes the introductory seminar as a fundament that we are going to broaden with an understanding of epi genetics and the gastrointestinal system, metabolic processes undergone and the role our liver play in digestion, detoxification and elimination of toxins from the body before moving on to mindful eating and overcoming challenges that our pre-programmed eating habits and cravings bring to the table. We are going to consider the impact of your individual requirements and possible health issues as we realise those have a profound influence on your life and need to be considered. The first half of the day includes content as described above. The second half of the day will introduce practical knowledge on food types and nutritional value, what to eat and what not to eat in order to optimise your wellbeing and help your family members and friends. We are going to look at the daily requirements and provide a tool for tracking your daily needs for macro and micro nutrients before going through easy to do recipes and preparing a meal ourselves. The idea is to give you the necessary information and practical knowledge on how to prepare tasty and healthy food for yourself and your beloved. To become mindful and conscious of ourselves, our eating habits and how what we eat is connected to how we feel and how much energy we have to do the things we want in life. We will also provide you with further reading material and all sources for the entire program including a useful tool on how to read scientific studies so you will be able to keep up with the latest in nutritional research that is available to everyone if you know where to look and how to read it. Furthermore, we will equip the most curious among you with the growing list of medical doctors and clinical practitioners that practice lifestyle medicine and have a successful track record with their patients suffering from chronic disease. We are going to finish with a time slot for questions and answers as we are sure a lot of the content is going to be new and conflicting with the intentionally confusing mainstream nutrition field. Reach your full potential! — This life changing programme teaches you the tools to improve your health and energy levels that enable you to increase your performance and elevate your business results. This workshop combines the latest in nutritional science to teach you the tools to sustaining vitality and success – to reach your full potential.